Sigh… Pie Crust. It’s either your best friend or worst enemy. 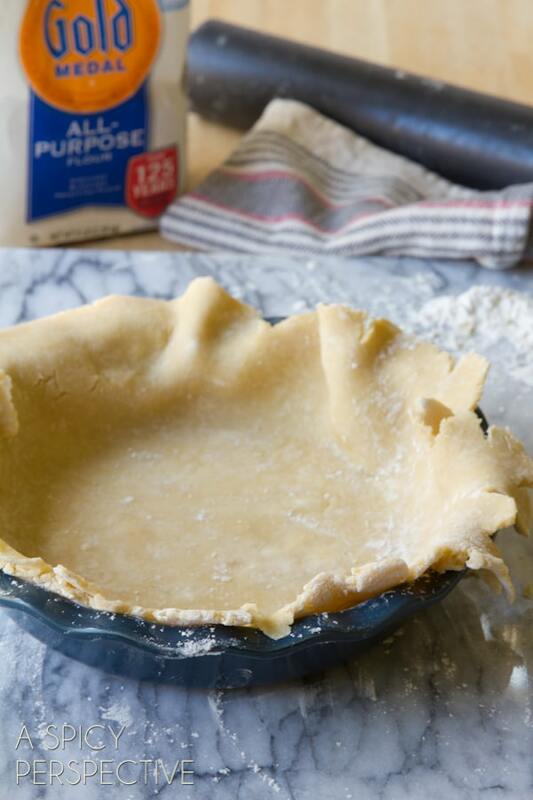 Today I want to show you a few tips on “How to Make Pie Crust” that should make your holiday pies and tarts much more successful. 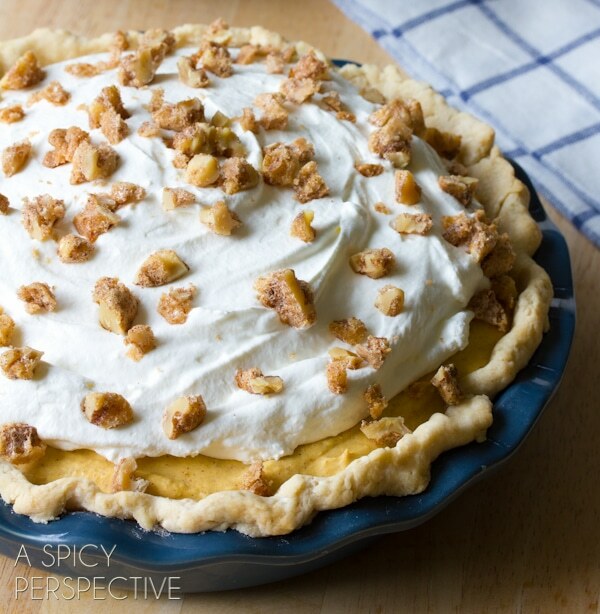 What makes a pie crust memorable? Flaky. Buttery. Slightly sweet or salty. Tender, not tough. Most people think of a pie crust as a platform for bigger and better things, but I believe that a good pie crust makes the pie, even more than the filling. Think COLD thoughts when making pie crusts. Make sure both your fat and liquid are ice cold. I cut my butter (or shortening) into chunks and place it in the freezer for a few minutes so it’s really cold before blending into the flour. Same with the liquid. Whether I’m using water, milk, or booze I always pour it over ice before measuring it into the mixture to keep it cold. Scoop and level your flour. Mis-measuring ingredients is one of the most common reasons for baking failures. It’s easy to do when you’re in a hurry, especially with flour. Anytime I measure flour, I stir the flour in the bag to “sift,” scoop it into the measuring cup with a spoon, then level the measuring cup with the handle of the spoon or a knife. In a perfect world we would all measure flour by weight so this simple baking error would never occur. Yet the scoop-and-level method is a fairly accurate method because the flour doesn’t settle in the measuring cup like it does when you scoop the cup in the bag, packing it down. Some people add water or milk to their pie crusts, but I like to use BOOZE! 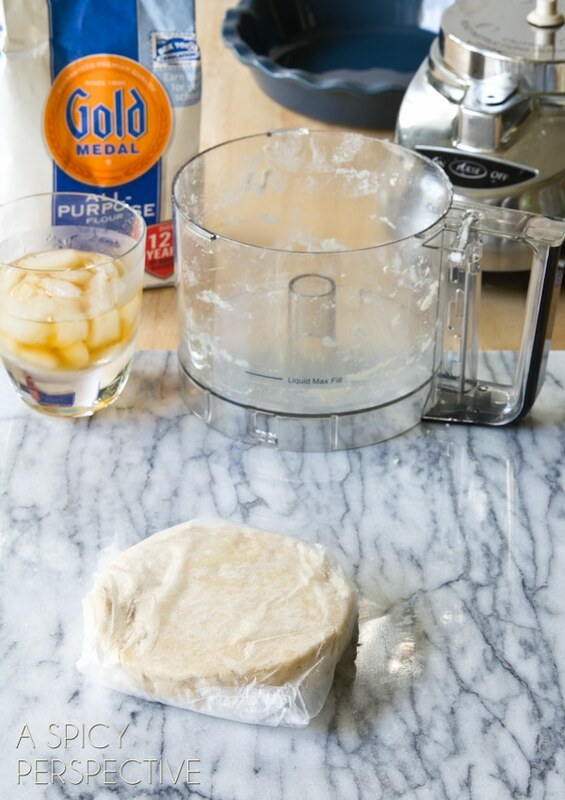 Adding brandy, bourbon, amaretto, or your favorite booze to pie crusts adds an extra element of flavor to the dough. 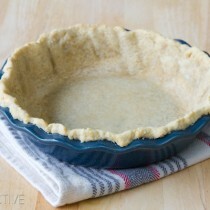 Plus since it evaporates at a greater rate than water, it bakes away leaving the pie crust extra crisp and flaky. And don’t forget, the less liquid you add to your pie crust the better. You want to add the booze one tablespoon at a time to make sure you’ve used just enough so the pie crust forms a clump, but is not moist. Good pie crusts take time. Once your dough forms a clump, dump in out onto a piece of plastic wrap and form into a disk. Wrap it well and place in the fridge for no less than 30 minutes. This will ensure it rolls out firmly, so it doesn’t stick to the pastry board or counter. Roll with tons of flour. Since you were so careful in measuring your flour earlier, now is the time you can go a little crazy! Flour your counter or pastry board well, then flour the rolling pin. Ample amounts of flour keep the dough from sticking to the work surface, which of course is a pie crust disaster. 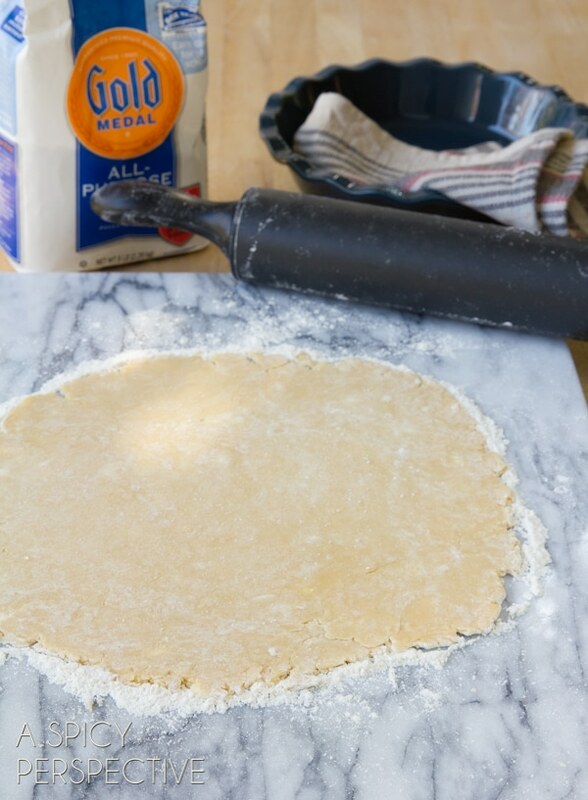 There are two methods I use for moving rolled-out pie dough, the rolling pin method and the wax paper method. I use the first method for standard crusts. You simply roll the end of the pie crust over the pin, then quickly move it to the pie pan and unroll. The wax paper method is something I do when I’ve swapped out some the the flour for cocoa powder, ground nuts, or cornmeal, because the dough doesn’t have the same stability from the extra gluten. In this case, I roll the dough out on a piece of floured wax paper, then quickly move and flip the whole pie crust over into the pie pan. Once the crust is in place, I peel off the wax paper. Dough is not meant to be stretchy. In fact, it will pop back out of the shape you stretched when you’re not looking. So always “fit” the dough into the pie pan to the corners, don’t try to stretch it or poke it into place. 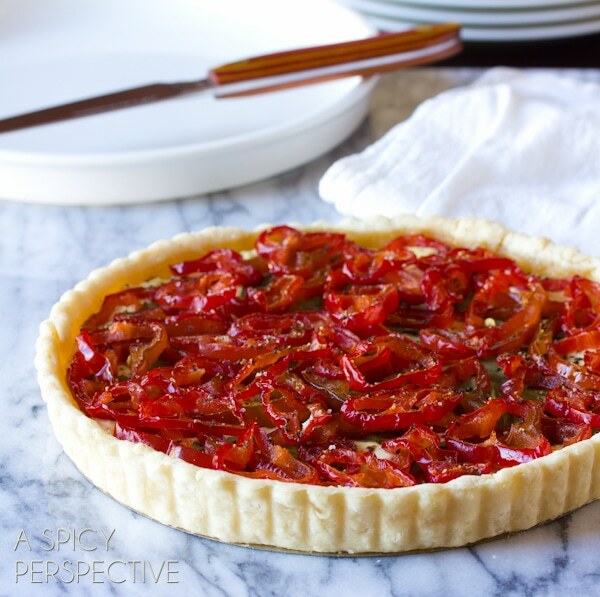 For tarts, simply fold the excess dough over the metal edge and press to cut it off. For pies, gently fold the edges under and use your pointer finger on one hand and your thumb and index finger on the other hand to pinch the edge into a wavy top. Don’t worry too much about perfection here. Pies are generally considered rustic, and the dough going into the oven COLD is much more important than a pristinely crimped edge, in my opinion. If you are a perfectionist, God love you, then crimp until your heart’s content, and put your pie crust back in the fridge for another 20 minutes to be sure it is very cold before going in the hot oven. Bake on the bottom rack. Ever move your oven racks around? I move mine all the time! Baking your pie crust on the bottom rack position means the bottom of the pie is closer to the heat source so it’s more likely to bake until crisp. Otherwise you may end up with a perfectly golden-brown rim and a raw doughy bottom. 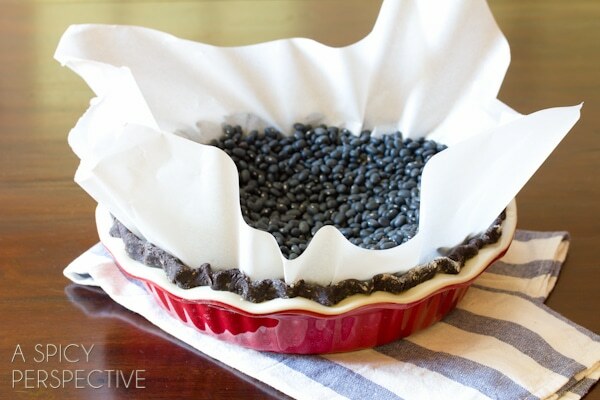 Do this when baking both filled pies or empty pie crusts. So you want to make a cream pie with pre-baked pie crust. Don’t forget the pie weights! Without something heavy pushing against the bottom and sides of the pie crust, it will slouch, bubble, and lose its shape in the oven. You can actually buy ceramic pie weights shaped like little balls, or do what I do and keep a bag of dried beans or rice around for just this purpose. Fit a piece of foil or parchment paper into the prepared pie crust, then fill it with “weights” and bake 15-20 depending on the recipe. Once the pie crust has cooled a little, lift the weights out and store for next time. Cool the pie crust completely before filling. 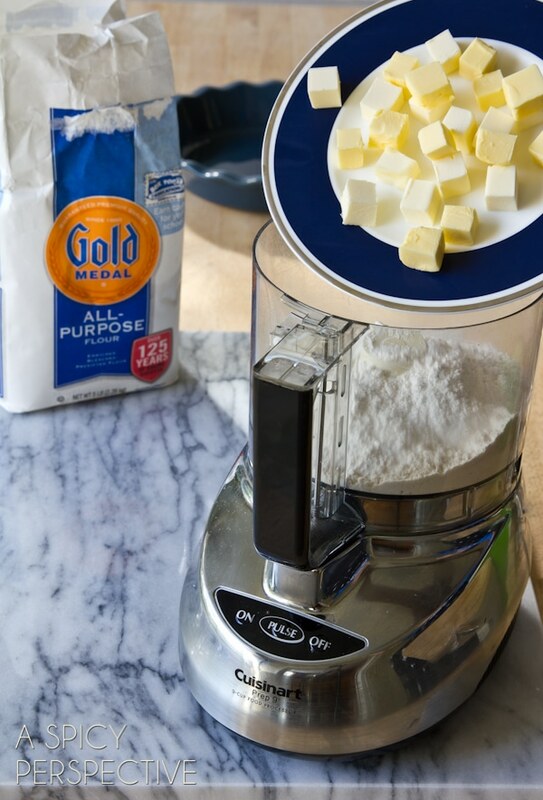 Place the flour, salt, and sugar in a food processor. Pulse a few times to mix. Add the COLD butter and shortening cubes and pulse until the mixture resembles peas. Add the amaretto and 1 tablespoon of cold milk. Pulse again until the dough comes together. Add another 1-2 tablespoons of milk if needed. Dump the dough out onto a sheet of plastic wrap. Separate into two equal pieces and flatten into two disks. Wrap each disk in plastic and refrigerate for at least 30 minutes, or until ready to use. If baking with pie weights: Preheat the oven to 375 degrees F. Roll the dough into a large even circle, 12-13 inches across. 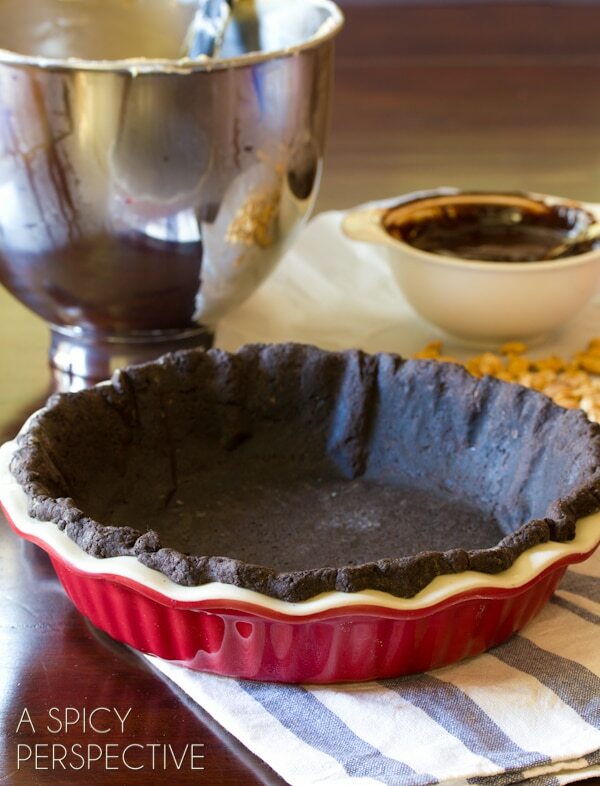 Fit the pie crust into a pie pan. Crimp the edges. Then place a piece of parchment paper in the crust. Fill with pie weights and bake for 18-20 minutes. I see you use butter and shortening. 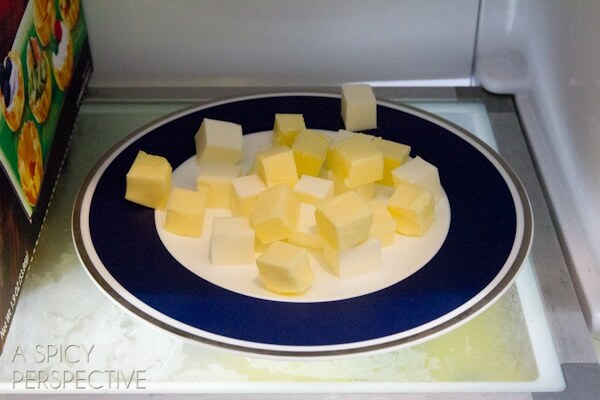 Would using just butter be a problem? You can definitely make crust with just butter. It’s just a little easier to work with when it includes shortening. Sommer, I must say this was the best pumpkin cream pie I have ever eaten, thanks for sharing your recipe. However, I must ask, is the size pie plates you use a family secret? :) I noticed you never give the size for a particular size. did notice that in most of your pics the pie pan/dish seem to be about a 9 inch deep. 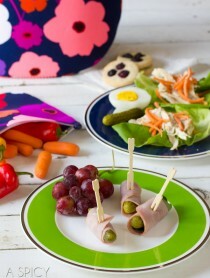 Could you tell me what size plate you used for this recipe? The first ingredient under the heading “Ingredients” says “3 All Purpose Flour.” I assume you meant 3 Cups of flour. Is that correct? I must say that I have always been a complete failure when it comes to making pie crust. For years I have used the boxed version simply because I could never make the real thing work. But the idea of adding liquor to the recipe intrigued me enough to give it a whirl. And I must say, this was so easy! And it worked! And it tastes amazing! I used amaretto in the mix and made a pumpkin pie. The hint of almond flavor in the crust, which is as tender and flaky as Sommer describes, is incredible. Thank you so much for bringing me back into the homemade pie crust fold! Awe! Betty Lynne, I’m so glad you liked it. That just made my day. Thanksgiving is all about sides and pie for me, and I’m so looking forward to tomorrow! 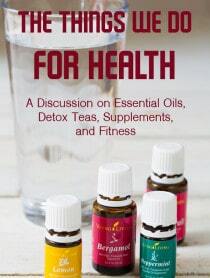 So helpful :) This looks delightful! I can’t believe I’ve never made pie crust from scratch. would be awesome for a chocolaty filling. This is great-I am still not really confident about pie crust, but do love the food processor. What type of pie crust is that blue one? did I miss what it is? Hey Paula, there’s a list at the bottom of the post with links to the recipes, and that is the first one. Classic Crust. Thanks, Sommer! 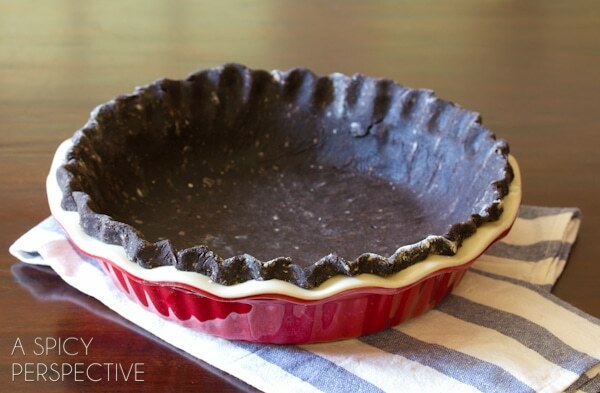 My husband laughs because I will only use the freshest ingredients for my pies, but I pull out the store-bought crust because my homemade pie crusts are always terrible! 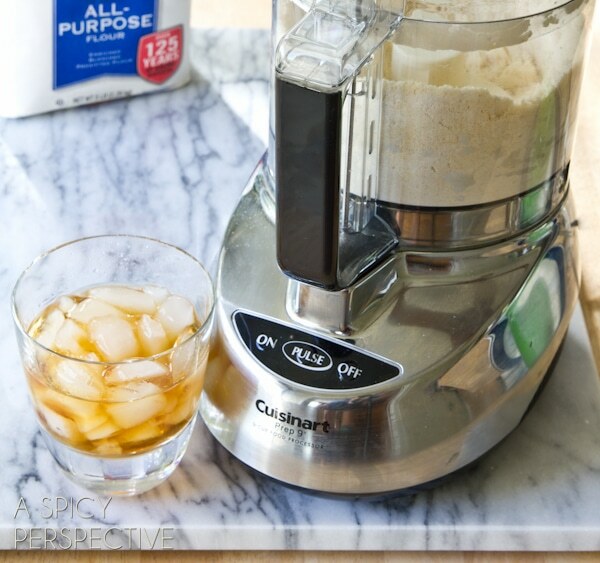 I am very excited to try making it in the food processor with these tips. The 538th attempt has to be the charm, right? Right! You can do it Carol!! I am book marking this!! Pie scares me but every once in awhile I get the itch!! Oh, do I ever need this! This is such helpful tutorial, Sommer. 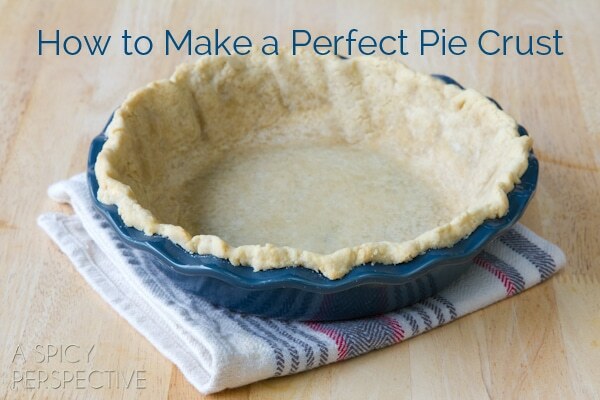 Great tips on a perfect pie crust! 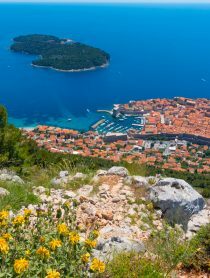 Such an informative post – thanks Sommer! Love this easy and helpful tutorial, Sommer! 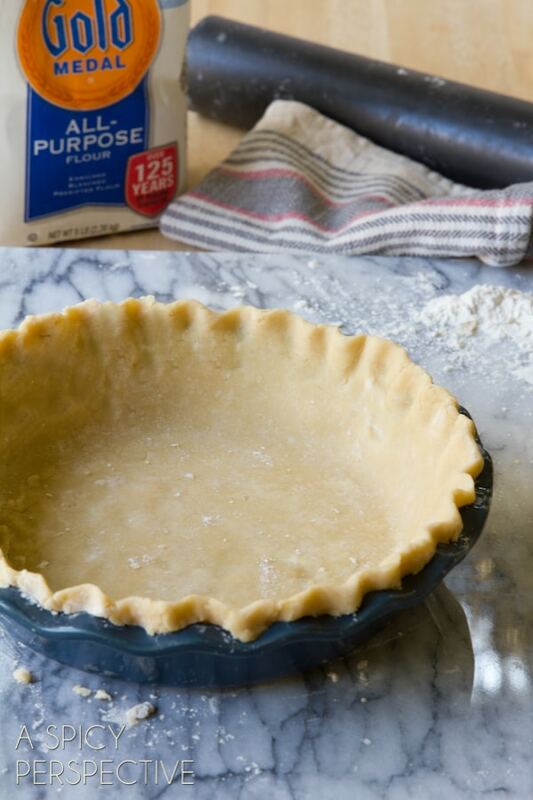 We should all have a go-to pie crust and yours looks foolproof! This is a life savor, Sommer!! BOOKMARKED!! Is there an easy way to print this? I got 28 pages, mostly blank as the pictures didn’t print. Great tutorial, Sommer. I’m with Jenny. I need pie now! I have been baking a long time and some these tips were new to me! thanks Sommer, a good pie crust is a wonderful tool to have! Pie crust in the food processor is so smart. Love this!